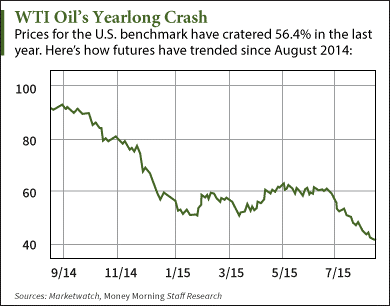 Some of the best oil stocks to buy now are trading at discounted levels thanks to the drop in oil prices. WTI oil prices currently hover near $42 a barrel. That's down 26.9% from January and 56.4% from last August. The S&P 500 energy sector has fallen 13.7% and 27.7% over those respective periods. But those low prices give us the perfect opportunity to buy certain oil stocks at a discount before prices begin to rise. After all, large oil firms like Chevron Corp. (NYSE: CVX), BP Plc. (NYSE ADR: BP), and Exxon Mobil Corp. (NYSE: XOM) have cratered 34.1%, 25.8%, and 20.9% since last summer, respectively. According to Money Morning Global Energy Strategist Dr. Kent Moors, crude oil prices will reach as high as $76 by the end of the year. That's because the low-price environment is ushering in a wave of M&A activity. That will result in a new group of large companies that will lead the sector into the "new energy age." We've already seen it with deals like Royal Dutch Shell Plc. 's (NYSE ADR: RDS.A) acquisition of BG Group Plc. (OTCMKTS ADR: BRGYY). The $70 billion transaction was announced in April and is the largest energy acquisition in more than 10 years. Last November, oilfield services giant Halliburton Co. (NYSE: HAL) announced its purchase of competitor Baker Hughes Inc. (NYSE: BHI) for $34.6 billion. All of the consolidation within the energy sector will make the market much leaner by the end of 2015. "We will see a restructuring of assets throughout the upstream (production) to midstream (transport and soon export) to downstream (refining and distribution) process," Moors explained. "All of these will hand us some very nice investment opportunities down the road."